Surviving on the treacherous Iron Seas requires a heart of steel…but how can Yasmeen hope to survive when her heart has already been stolen by Archimedes Fox…? Tethered along the south dock of Port Fallow, Captain Yasmeen Corsair’s magnificent new airship, Lady Nergüi, awaits its departure with adventurer and treasure-hunter Archimedes Fox. But this time, Yasmeen, a fearless mercenary who has always prided herself on a heart of steel, has reasons to worry when Miles Bilson, an acquaintance from Archimedes’ earlier smuggling days, sends an urgent message requesting help. With a past marked by betrayal, Archimedes wonders what his former partner could want—other than revenge. Yasmeen fears that Bilson could threaten everything Archimedes holds dear. Though both Archimedes and Yasmeen love the exhilaration of veering wildly off course, neither is prepared for where there newest risk will take them…or what it might cost them. Tethered is a wonderful novella set in Meljean Brook’s Iron Seas series set sometime after the second book, Heart of Steel. Although this story can be read stand alone, it does build upon the events in the second book, and therefore, contains some spoilers from Heart of Steel. Also, I feel those that have read the series will have more emotional investment in the characters. The story opens with hilarious letters sent between our hero, Archimedes Fox and his sister, Zenobia. Their correspondences set the mood for the story, and although there are extremely serious moments during the book, the letters serve as a reminder that the characters know how to laugh at themselves and enjoy life. An old associate of Archimedes shows up on board the Lady Nergüi, and soon Fox and Yasmeen find themselves on a rescue mission for which they did not willingly volunteer. But no matter the circumstances, Archimedes and Yasmeen seem to always be on step ahead of the nefarious Miles Bilson. I adore how much Archimedes loves Yasmeen. Knowing she is carries much sorrow from the loss of her previous airship and its crew, he finds a way to help her deal with the painful memories without compromising the woman she is. The fact that he danced for her, joked and played, then finally loved her so that good memories would replace the bad is so wonderful. Throughout the entire story, the interaction and play of emotions between Archimedes and Yasmeen is amazing. Ms. Brook has a gift for putting heart and soul into words, allowing an array of emotion and sentiment to leap off the pages. The pair are playful with their words and actions. They accept the other for who they are and accommodate differences out of love. Whether through quiet introspection and subsequent actions or passionate outbursts, the pair can communicate at a level that would make real life couples envious. I adore how much they love one another. Although there are a few known players in this book, Ms. Brook creates a handful of colorful characters unique to Tethered. She gives each character enough background and page time to provide this novella with the richness of a full-length story. And our villain, Bilson, is desperate and cruel with the shine of a new penny. I wanted to strangle him more than once. 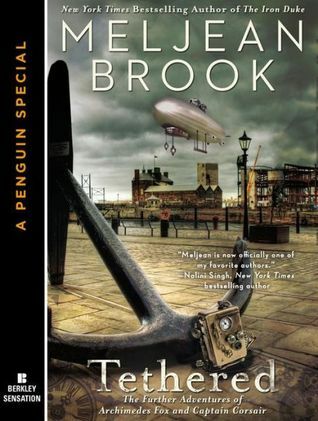 In conclusion, Tethered is an excellent story and perfect sample of Ms. Brook’s storytelling talent in the steampunk romance genre. The depth and range of the plot, characters, and actions are on par with that of a full-length novel. The plot twists are exciting; they never feel contrived, and the story flowed well. The action and adventure kept me on the edge of my seat, but it’s the characters and their stories that give this story and series real heart. I really need to read this series. I’ve read nothing but fabulous reviews for it! I love this series and for some reason didn’t know about this one. I need to read it!